For a lot of local businesses, their Google My Business listing actually drives more leads than their website. If you don’t have the infrastructure in place to track phone calls and clicks from your GMB listing, you should seriously consider changing that—don’t rely on questionable insights from your Google dashboard. The majority of searchers these days are on a mobile device, and they want information presented to them as simply as possible without the need for extensive navigation. In order to improve user experience, Google has made even more information accessible from your knowledge panel. This goes beyond basics like your phone number, address, and directions. Users can also read reviews, find additional menu links, read descriptions, and check out your business amenities. 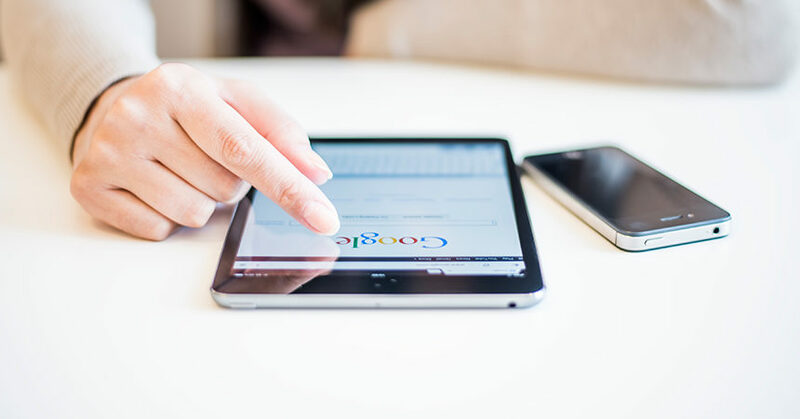 In order to help you maximize your lead opportunities at a time when fewer customers are actually visiting your website, I’ve put together this list of six simple Google My Business optimization tips for dealers. Google’s algorithm for local pack and finder results is trimodal, which means it incorporates proximity, relevance, and prominence into the equation when calculating which businesses to show. There’s not much you can do about your location, but you can definitely take strides to improve the other two components. The best way to show Google that you’re the best dealer for the job is to have the right category on your listing. Sure, you can just choose the generic “car dealer” as your primary category, but you can most likely be more specific than that. Are you a franchise dealer or a used car dealer? Google has categories for those, and others. Don’t forget to select some subcategories as well—you can have up to 10 categories for your listing. Do you have a phone number that allows customers to text you? If so, give them that option right from your knowledge panel in search. If you go to your Google My Business dashboard, you’ll see an option for messaging that allows you to verify and activate a chat feature for your customers. Once activated, it shows up only on mobile, but will make it even easier for your customers to get in touch. Some dealers do a fantastic job of reputation management, and others don’t seem to make it a priority, which is a big mistake. Not only do reviews factor into the rankings for local search, they also have a substantial impact on user behavior. According to a Bright Local study, 85% of consumers trust online reviews as much as a personal recommendation, while 77% of them think that reviews older than three months are no longer relevant. Also, in a 2017 study, it was discovered that 20% more local searchers will call a business after reading just one positive review. These are just a few of the compelling reasons you need great reviews for your business. 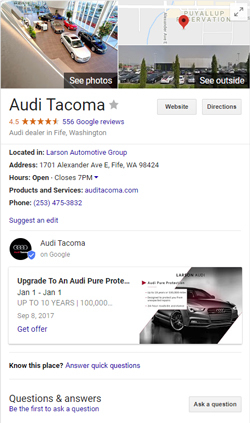 Google might not be the only review platform that matters for your dealership, but it’s arguably the most important. I mentioned earlier that mobile users don’t want to navigate your site to find what they’re looking for. The menu URL in your dashboard is just another opportunity to make users’ experience more seamless. You’re a car dealership, so most of your customers are probably looking for vehicles to buy. The menu link shows up in your knowledge panel as “products and services,” so why not include a link directly to your inventory to start racking up those VDP views? Google posts are another element that can deliver small ranking benefits if used regularly, but that’s not where their power lies. Your knowledge panel likely shows up for any type of branded search related to your business, and that’s a lot of opportunities to drive awareness with your audience. Forget the home page slider on your website that everyone ignores—if you want to promote your current sale, event, latest blog post, or even show off that cool truck your service department accessorized, then a Google post is the perfect way to direct traffic. One thing local business owners don’t seem to realize is that they don’t have complete control of their dashboard. Google makes the final call on things like your primary listing photo, and anybody can suggest edits to your business information. Google will notify you in the dashboard if you have any updates that need to be reviewed. If you neglect your listing, however, you could end up presenting inaccurate information to your customers, such as outdated or wrong business hours and contact details, which might cost you money. By implementing these six simple tips, your dealership will be generating more leads than ever, even if customers never look at your website. Happy selling! Patrick Leonard has 10 years of automotive experience and has worked as the marketing director for popular franchise dealers like Ford and Mazda. He’s now the owner of Brighter Digital, which focuses on search engine optimization for local businesses.